Tip: Re-paving? 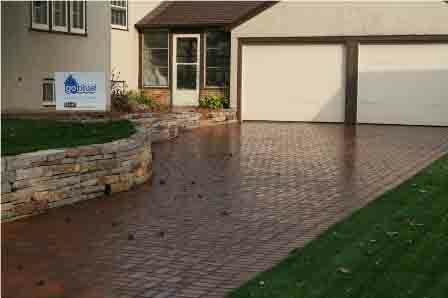 Consider porous pavement, which lets water infiltrate through so it can return to the soil instead of flowing into the storm drain. (Learn more about this clean water tip). OPEN What is a Wetland? Wetlands are characterized by wet soils and support vegetation that adapt to the damp conditions. They provide benefits such as clean water, habitat for wildlife and places for recreational activities like bird watching. A constructed wetland has become a more common method of stormwater management due to the extensive benefits wetlands provide. Wetlands are among the most productive ecosystems in the world, comparable to rainforests and coral reefs. Wetlands are found from the tundra to the tropics and on every continent except Antarctica. An immense variety of species of microbes, plants, insects, amphibians, reptiles, birds, fish, and mammals can be part of a wetland ecosystem. In Minnesota cattails, wild rice, tamarack and cedar trees all grow in wetlands. Many animals also make their home in wetland ecosystems. Wetlands are identifiable because of their unique soil conditions, including wet soils or standing water for all or some of most years, and vegetation adapted for these wet conditions. Wetlands typically occur at the edge of aquatic and upland systems. They can be wet year-round, or just during certain seasons. They are also known as bogs, marshes, cedar swamps, and potholes. Wetlands come in all shapes and sizes and each one is different. There are 8 common types of wetlands in Minnesota. When working near wetlands or planning to build near a wetland, it is important to minimize the impact of development as much as possible. In many cases it is advisable to avoid building on or near a wetland entirely. Shorelines and streambanks are important and intricate parts of aquatic ecosystems. Managing these areas properly is important to the health of our lakes, rivers and streams. Erosion is a significant problem around shoreline and streambanks. Eroding soil can fill in our lakes, streams, and wetlands, and weaken the area, making it more likely to collapse. This is especially troublesome for homeowners who live near a creek. Establishing a clear and realistic plan for managing a lake is a powerful tool to help protect natural resource systems, including the water quality of the lake and its fish, plants and wildlife communities. What Does a Lake Management Plan Do?